Hey Ren. Thank you for this list. I will definitely put The grave of Fireflies on my to-watch list. I love japanese manga. The last time i “feel” something watching movies is when i watched Departure (Okuribito) which also Japanese (not manga) movie. Have you watched it? Please watch it, Farah . I haven’t watched Departure, but I’ve heard of it. So, yes, I will, if I can find it. I hope Netflix has it. How are you, Farah? Are you still in Japan? Long time , no see here. Well, to answer your question. I am fine 🙂 I feel i haven’t been properly updating my blog since forever. I’m already back in indonesia right now. So much stories about Japan i should have share on my blog, but i’m a real definition of slacker in terms of blogging 🙂 God, I havent even open my hard disk full of Japan photos. Help! You have to post those photos ! ! I’ve been checking out your blogsite… nothing. T.T Blog again, Farah. Thamk you, Jueseppi. I hope your hundred thousand readers wilk like it. It’s a tear-jerker. The beginning of Finding Nemo gets me every time, as do a few key moments in Wall-E.
* trying to recall the beginning* Fail. I don’t remember crying over Finding Nemo…. but I think I teared up over Land Before Time, Part 1. Cary, I forgot this, and it’s a pity I forgot to put this on my list… oh, but then it’s a video game… it’s fine then. Well, I cried over Persona 3…. I mean, really cried. I don’t want to spoil yopu. Watch it, Andy. Let me know if it’s indeed one of the most powerful anti- war films , so far. The West sees it as an anti-war film, but , believe it or not the director/writer days it isn’t and insists he hasn’t put any anti-war message at all. I think the director is in denial, or maybe it’s cultural? I don’t know…. seriously , there’s no way it’s cultural. It’s a WW2 story. The young siblings were made orphans by the war. I don’t want to spoil you, though. Watch it, Andy. My Dad never cries at sad movies… but I ‘ve seen him cry his heart out at least 3 x., the latest was when our dog, a Labrador, died. They were buddies. I’ve heard of Hachico and Maeumi. Hachico is Japanese and Maeumi is Korean, I think. I want to see these films, but I can’t find them anywhere. Dogs are really amazing. Not watched any of those other than Ghost (meh) and Forest Gump . . . I’ll check out “Graves for the Fireflies”, but if it has a bad ending I likely will not watch it. Neither will my wife. My impetus for reading books and watching movies is escaping from the real world. If I want tragedy, I have enough I can focus on in the real world. http://youtu.be/zlfKdbWwruY – because of the people we see living in places that are pure hell (at least from my perspective), but they still manage a smile. http://youtu.be/Pwe-pA6TaZk – the scene with the people in wheelchairs. Those two videos can do that because there are real people in them. Movies have a harder time making me cry because they often go out of their way to elicit the response, and it comes across forced, contrived. There have been a few, but I can’t recall them right now. I’ve watched quite a few of where the hell is matt. Beautiful. I don’t like movies with tragic endings, either. That’s why I’m okay with spoilers. I want to know what happens first before I watch a film , or read a book. There are enough tragedies in real life. *grin* I can’t understand the language, but thank you for reblogging ! Cheers ! It’s all about the horror of war and how it affects the children.I’ve seen so many images of children during WW2, Vietnam War, and Korean War. Depressing film, isn’t it? We have a dvd copy of it, but I can’t watch it again. Ugh. I watched “If I Stay” last week and it really made me cry a lot, to think that the high school-ers around me looked pretty normal haha. 🙂 But no movie has beat “My Sister’s Keeper”. My head ached after watching it. Wow ! I watched If I Stay, too. For some reason, I didn’t cry. Of course it’s sad that her entire family died. I guess there’s something that triggers my tear ducts , something weird, ha ha. I mean, why didn’t I cry when her family died? That’s weird. Oh, and welcome to my blog. Graveyard of the Fireflies was emotive, thank you for introducing me to that one, it did bring a lump to the throat, I tend to shy away from films that are to emotive as I love books more but haven’t cried at a book. Apparenly as a kid I cried at a Lassie film because he got left behind when a family moved…I don’t remember myself though. About that Harry Potter movie… actually I didn’t cry at the movie coz I knew he was going to die, ha ha… but I cried at the book. And I didn’t cry because he died, I cried at his sad life. He was most hated and villified, but all this time, he was the one protecting Harry… and sacrificed himself for love. My great grandfather adopted 2 children whose parents died during WW2. About Grave of the Fireflies… it’s the horror of war, and and what it does to the innocents. I have to watch some of them on the list as I haven’t. Normally I go soft but don’t really cry. These days sometimes I gets too emotional. Take care gal. My list are old movies, but we have dvd copies here at home. ( except Transcendence… it came out about 6 months ago, I think. ) ugh. I’m a crybaby. It can get a bit embarassing and awkward. Ar Marley and Me, I tried to supress the tears, I ended up crying with sound effects. ha ha. A bit embarassing. It was fine, though. Even the guys cried. I’ve seen them all except “Grave of the Fireflies” … “Grapes of Wrath” (the book, but the movie was also excellent) made my cry. If you can find the movie ( I think Netflix has it… we have a dvd copy at home ), watch it, Lafemme. It’s semi autobiographical. It even happened to relatives of ours. My grandfather’s family adopted 2 children whose parents died during the war. Yes, men do cry at movies, and every time Field of Dreams is on, I bring my husband a box of kleenex so he can have his emotional moment! Field of Dreams..,, oh, wait, is that the one with Robin Williams in it ? You have a sensitive soul…. Awww, that’s nice. Thank you, Ms. Divah. Have not seen all of these but many and yes they are gripping and emotional that tug at the heart strings. You know your movies and wouldn’t mind seeing some of them again, and again, and again. wonderful post! Ugh, to be honest, I don’t really want to watch sad movies. that’s why I still haven’t seen Titanic, and don’t plan to watch it ever. I cannot watch sad movies, too much sadness in reality for me to pay to see sadness. I do love Syfy though. same here… that’s why I always look for spoilers, lol. That’s true. There’s too much sadness in real time… I don’t want to see it in movies. I just want to be entertained. Ghost got me for sure. My wife and I needed to be apart and we saw that movie before I left. Unchanged melody became our song. I still can’t keep a dry eye when I think of those last words. Also, my wife’s name is Molly. Love is such pure human emotion. Oh, my gosh, and your wife’s name is Molly ! ! I think love is the only thing that can make us cry. Well, there’s cry from happiness, like if we won the lottery. Ha ha… that’s different. I never cried during the notebook. But every time the notebook trailer came on I cried like a baby! I loved Forrest gump! I cried during House of the Flying Daggers when she laid dying in his arms..
Close to You when her sister dies..I die every time I see that movie! Hannibal Rising..I cried when Hannibal didn’t realize he ate his sister, and when his mistress walked out on him. I love it when a movie,TV show or a book leaves a person emotionally wrecked!!! LOL You cried over Hannibal ? the last Toy Story made me cry too. Oh, man. I cried at the end of the Notebook. Everyone in the theater was crying thru out the movie, I was gagging. I loved Hannibal Rising. Not Hannibal, eep. It was a beautiful movie. I’ve been meaning to review Transcendence at some point, actually. Such an interesting movie, with such a unique message. I went in with low expectations and was really surprised by just how good (and how emotional!) it was. I thought the advanced technology was too much for me,. I couldn’t appreciate what I couldn’t understand… then I switched it from high tech syfy to something that I could relate to… a love story. I do think it’s about that. The ending affirms it. Yes renxkyoko men cry at movies but they pretend they don’t which is not only sill but bad for your health and emotional relationships. Transcendence was a surprisingly powerful love story but I’d put The Notebook at the top of my list. Enjoyable reading thank you. I cry when I am happy, and also when I am sad, happy endings easily bring it on, especially when they are true life stories. When someone is hurt around the world, i will feel it and will cry. Do i cry all the time know, but when something touches my heart or when something triggers a memory within, I will go into another room and shed tears. Crying is something that helps us emotionally, it shows that one is growing and progressing in being human. You got a good heart Ren, never change, and like Mike said, yes a lot of men cry…when its heartfelt! Wonderful post and message! Hugs and blessings! 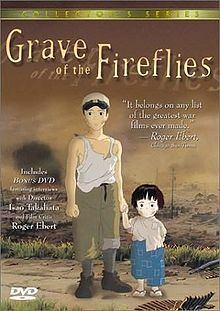 Grave of Fireflies made me cry so much… I can’t even explain. The Notebook? I love the book better than the movie of course. I haven’t watched a movie in a long time but the movie adaptation of The Book Thief made me cry buckets. How are you Ren? I’m a big softie, when it comes to romantic or sad movies (that includes inanimate objects) – so I don’t watch them unless I’m forced. My fav. is horror – no crying then (I might screem a bit though LOL! Great article!! I remember crying in the theater when E.T. put his finger on Elliot’s forehead and said “I’ll be right here”. And I still get choked up Field of Dreams when Kevin Costner is having one last “catch” with his dad. Actually, I’d suggest not to watch it. It’s so depressing it would scar you for life. XD I wish I hadn’t watched it either. I read about that too. The director said that if the brother didn’t leave their aunt’s home, they wouldn’t starve , and die. Indeed , the aunt complained about the lack of food, but things wouldn’t go as far as letting the kids starve to die. They voluntarilly left the safety of a home. Nice list Ms. Iglesias. Ghost and The Notebook choke me up. Enjoyed this post.